A peaceful, stable, and prosperous ecosystem must be formed in the Indian Ocean and Pacific Ocean circles in the Indo Pacific Circle. This was conveyed by President Joko Widodo (Jokowi) when speaking at the ASEAN-India Warning Summit Indian Prime Minister Retreat session with the Head of State / Head of ASEAN Government in Rasthrapati Bhawan, Thursday (25/1). “I believe through ASEAN-lead mechanism and through the ASEAN-India partnership a peaceful, stable and prosperous Indo-Pacific region can be achieved,” said the President. Furthermore, the President said the Indo-Pacific concept can naturally be developed based on the Treaty of Amity and Cooperation of ASEAN where all key countries have become parties to the treaty. “The development of the Indo-Pacific concept, should also be carried out openly, transparently, inclusively based on the habit of dialogue; based on the desire to work together and uphold international law, “the President said. With such a concept, the President continued, it will be avoided unhealthy rivalry that can lead to “power projection”. The development of the Indo-Pacific concept would be good if carried out through a building block approach, among others through strengthening bilateral and plural-lateral cooperation such as ASEAN-India, strengthening regional mechanisms such as IORA in the Indian Ocean, and ASEAN-lead Mechanisms, especially East Asia Summit (EAS) Pacific Ocean; Linkage and integration of the mechanisms of cooperation between the Indian and Pacific Oceans. “With the strengthening of building blocks will also create an Indo-Pacific region that became one of the main sources of economic growth, trade centers, and industrial world,” said President. On the occasion, the President underlined that maritime cooperation is key in the development of Indo-Pacific region architecture and Indonesia has a strong commitment in enhancing maritime cooperation through both IORA and EAS. “I want to take this opportunity to express my appreciation for India’s support for ASEAN’s centrality. 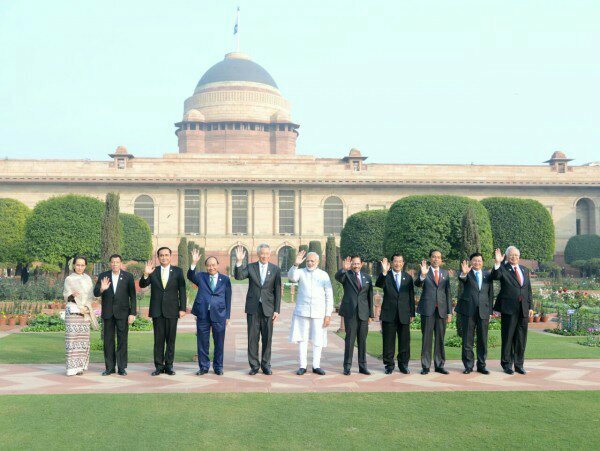 I am optimistic that ASEAN and India will be the backbone of Indo-Pacific cooperation, “said the President. At the beginning of his speech, the President said that last year, the State in Southeast Asia commemorated the 50th anniversary of the founding of ASEAN. He added that at the same time also commemorates 25 years of ASEAN-India partnership. “If for the past 50 years, ASEAN has succeeded in creating a peace and welfare ecosystem in Southeast Asia then the ASEAN-India partnership should also be able to contribute equally to the wider region,” the President said. Also present were President and Mrs. Iriana, Coordinating Minister for Economic Affairs Darmin Nasution, Foreign Minister Retno Marsudi and Trade Minister Enggartiasto Lukita. Prior to the retreat, the President and First Lady Iriana attended a luncheon for Heads of State / Government of ASEAN Members with Indian President Ram Nath Kovind and Ms. Savita Kovind who ended with a photo together. After the retreat, President Jokowi along with other Heads of State / Head of Government of ASEAN and Prime Minister of India Narendra Modi walk to Mughal Gardens to follow the photo together. At the time of the joint photo, President Jokowi stood between the Prime Minister of Cambodia and the Prime Minister of Laos.